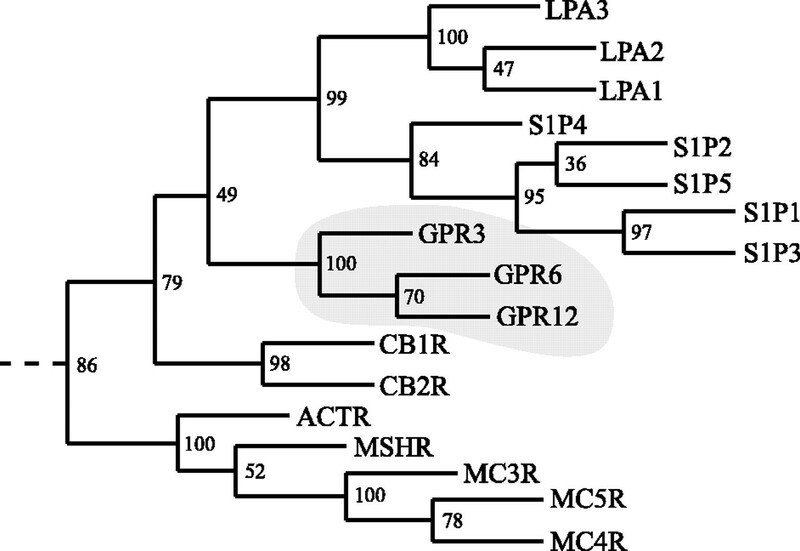 Section of an unrooted phylogenetic tree of human GPCRs. Numbers correspond to support values for each internal branch and were obtained by 100 bootstrap steps. Shaded receptors constitute a subfamily located between cannabinoid (CBR), lysophospholipid (LPA/S1P), and the proopiomelanocortin peptide receptors (MCR, MSHR,ACTR). SPC is a high-affinity ligand for GPR12.A, CHO/Gα16/mtAEQ cells were transiently transfected with the vector as control, with GPR12 without and with a signal-peptide sequence. Cells were treated with medium alone or with medium containing 100 nm d-SPC, and the Ca2+-bioluminescent response was measured at 469 nm. 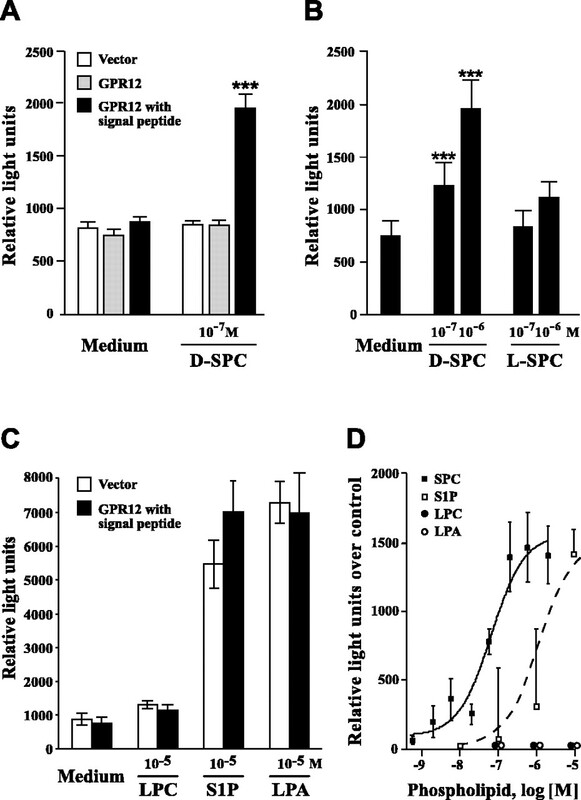 SPC induced a significant increase in luminescence in cells transfected with GPR12 with signal peptide compared with vector controls and cells transfected with GPR12 without signal peptide (***p< 0.001). GPR12 constructs with a signal-peptide sequence were used subsequently. B, The Ca2+-bioluminescence response was monitored after treatment with d and l stereoisomers of SPC. The increase of 10−7m and 10−6md-SPC over the medium control was significant (***p < 0.001). C, Other lysophospholipids were assayed at the indicated concentrations. LPC and LPA did not elicit Ca2+ responses, but S1P did. Eachbar graph in A–C represents the means of six determinations ± SEM. D, Dose–response curves, from which the endogenous responses were subtracted, yielded an EC50 value of 66 nm for SPC and 1.2 μm for S1P. LPA and LPC were assayed in the same concentration range but did not show any response. SPC is a high-affinity and S1P is a low-affinity ligand for GPR12 expressed in frog oocytes. A, Currents induced by 100 nm SPC were recorded fromXenopus oocytes injected with cRNAs coding for GPR12 with signal peptide and for GIRK, or with GIRK cRNA alone.B, Dose–response curves for SPC- and S1P-induced increases in GIRK-mediated inward currents were normalized against maximum currents obtained for each oocyte. Seven oocytes were measured independently for each agonist. The dose–response data were subjected to nonlinear regression analysis using the GraphPad Prism software.C, SPC-induced (100 nm) and S1P-induced (1 μm) GIRK currents were measured with and without a 12 hr pretreatment of oocytes with 200 ng/ml of pertussis toxin (PTX). 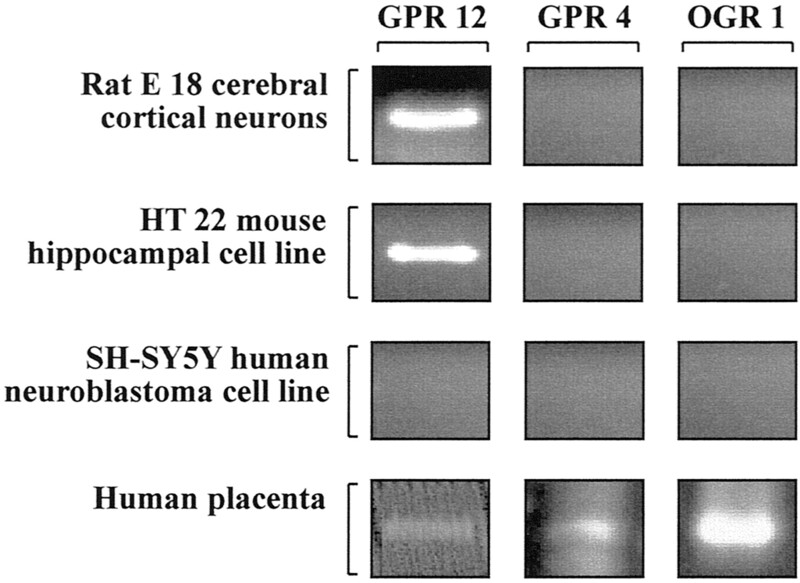 Expression of GPR12 during mouse embryogenesis and in the developing nervous system. 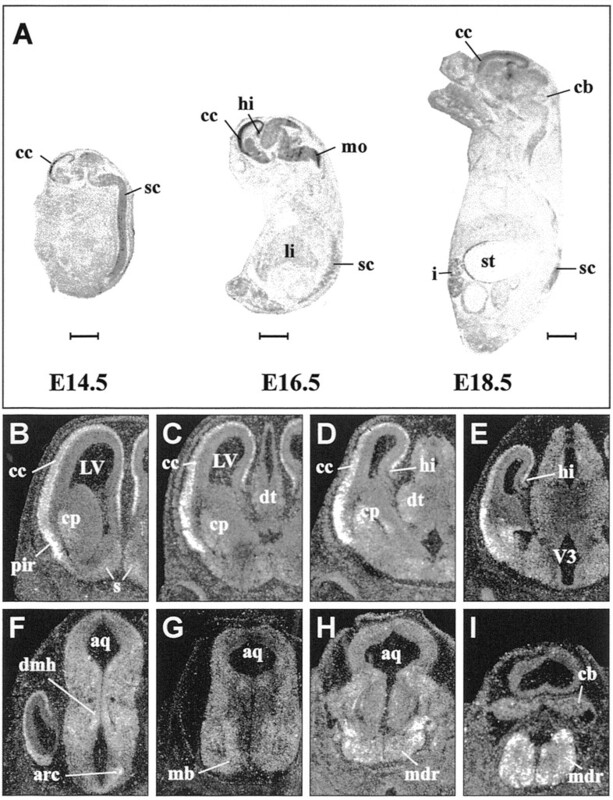 A, Autoradiograms of parasagittal sections through mouse embryos are shown at the stages indicated. Scale bars, 2 mm. B–I, Photoemulsion-dipped coronal sections through a mouse brain at E14.5 are arranged in rostral to caudal direction. aq, Aqueduct; arc, arcuate hypothalamic nucleus; cb, cerebellum;cc, cerebral cortex; cp, caudate putamen;dmh, dorsomedial hypothalamic nucleus;dt, dorsal thalamus; hi, hippocampus;i, intestine; LV, lateral ventricle;li, liver; mb, mammillary body;mdr, medullary reticular formation; mo, medulla oblongata; pir, piriform cortex;s, septum; sc, spinal cord;st, stomach; t, thalamus;V3, third ventricle. Expression of GPR12 in distinct areas of the adult CNS. 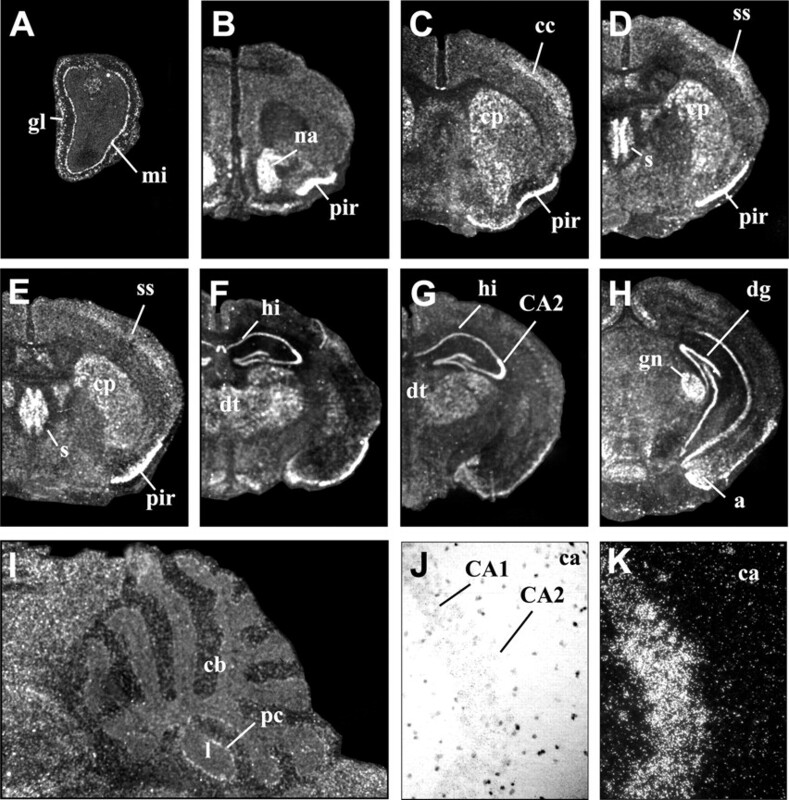 A–I, Dark-field photomicrographs of photoemulsion-dipped coronal sections through an adult mouse forebrain and midbrain and a sagittal section (I) through the cerebellum are shown arranged in rostral to caudal direction. J, K, A higher magnification of the hippocampus is shown as a bright-field (J) and a dark-field picture (K), depicting the intense hybridization signals arising from the pyramidal cells of the CA2 region. a, Amygdala; CA1, CA1 layer of the hippocampus;CA2, CA2 layer of hippocampus; ca, corpus callosum; cb, cerebellum; cc, cerebral cortex; cp, caudate putamen; dg, dentate gyrus; dt, dorsal thalamus; gl, glomerular layer of olfactory bulb; gn, geniculate nucleus; hi, hippocampus; l, cerebellar lobule; mi, mitral cell layer of olfactory bulb;na, nucleus acumbens; pir, piriform cortex; pc, Purkinje cell layer; s, septum; ss, somatosensory cortex. Presence of the SPC receptors GPR12, GPR4, and OGR1 in neuronal cells. The expression of RNA for the three receptors was probed by RT-PCR with primers common in mouse and human to amplify fragments of comparable lengths: 690 base pairs for GPR12, 769 base pairs for GPR4, and 714 base pairs for OGR1. If no product was obtained after 30 cycles, an aliquot was subjected to a second round of PCR. 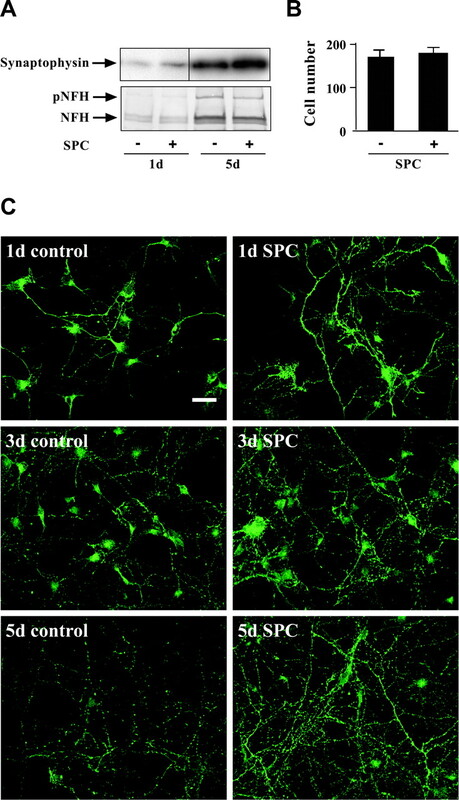 SPC stimulates cell proliferation and cell clustering in the hippocampal cell line HT22, and this response is stereospecific. A, HT22 cells were incubated for 3 d with the d and l stereoisomers of SPC at the indicated concentrations. The cell number was determined by coulter counter. Three dishes were counted each, and the cell number is expressed as mean ± SEM (*p < 0.05; **p < 0.01). 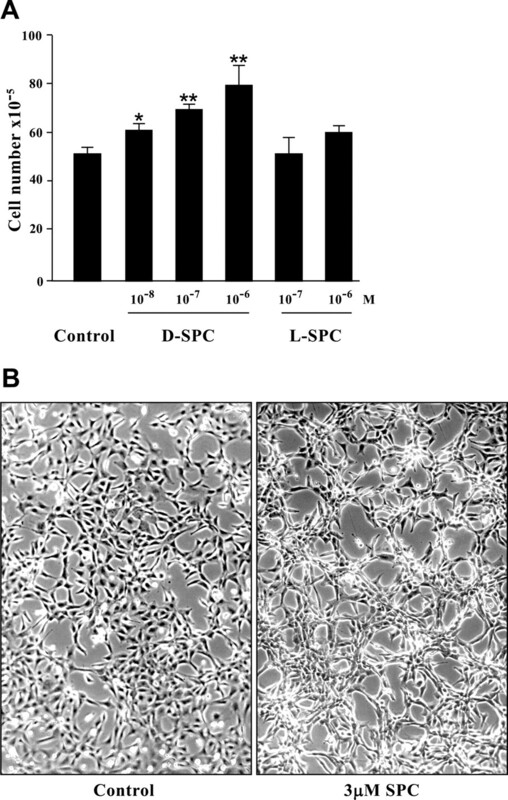 B, HT22 cells were treated for 4 d with increasing concentrations of SPC. Cell clustering is shown for cells treated with 3 μm SPC and compared with untreated controls. Primary cerebral cortical cultures of E15 rats respond to SPC by an increase in synaptic contacts. A, Western blots of extracts from cerebral cortical cultures treated for 1 and 5 d with 1 μm SPC were probed with antisera against synaptophysin and neurofilament H. Equal amounts of protein were applied per lane. NFH represents the unphosphorylated immature 160 kDa, and pNFH represents the phosphorylated mature 185 kDa form of neurofilament H.B, Total cell number was determined by counting three fields on three different slides after a 1 d treatment with SPC and is expressed as mean ± SEM. C, An increase in synaptic contacts of cortical neurons treated for 1, 3, and 5 d with 1 μm SPC was visualized by immunocytochemical staining with antisera against synaptophysin. Scale bar, 20 μm.